Verily Six Bugs (Tanner) was by our stallion, Verily Sixes. This was his first offspring to hit the ground, and he is a good one. His temperment is laid-back. 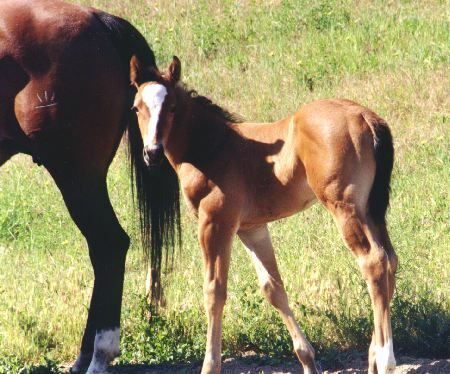 A nice horse to be around. 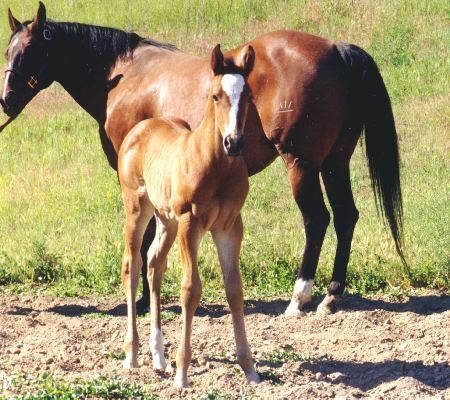 Read on, as this horse was a great example of the quality horses we raise at Sunrise West. Tanner's first performance year was in 2006 as a 4 year old, with his show career beginning in June. 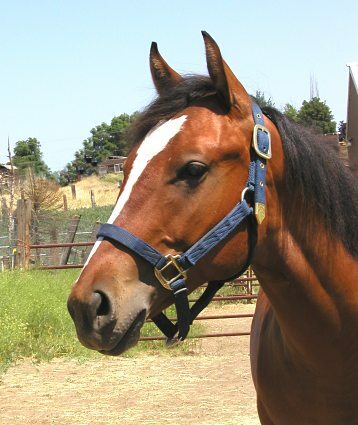 In 2007, he earned his AQHA Superior in barrels. 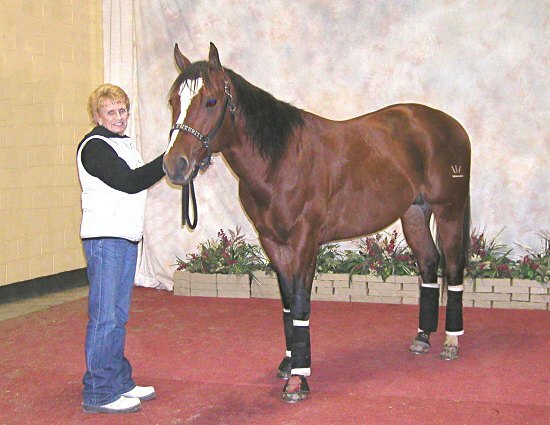 As a yearling in 2003, Tanner made the trip from our state of Washington to Long island, New York, where he became an important part of the program of Rita Gambino and Outlaw Acres. Rita reported, "Tanner has done awesome. IPRA/APRA rodeo - won over $1,000 at two shows - 4th at the first and 1st at the second against all the senior horses. 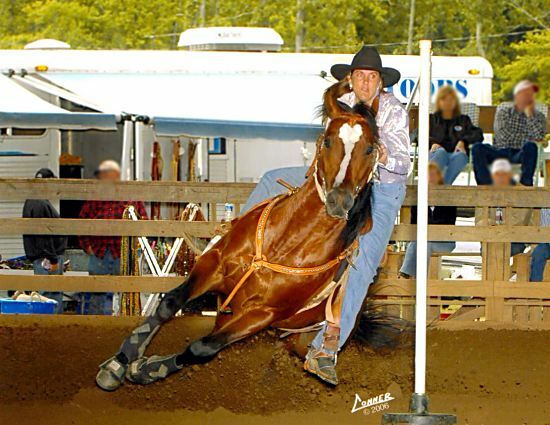 On one weekend he won all the barrel runs both days at the New Jersey QH show and the circuit award, the Jackpot, plus poles on Saturday with a 20.005 time. He has a ROM in barrels two shows out, and is qualified for the AQHA World Show. 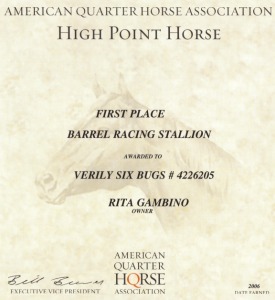 So we are going to the All American QH Congress.... We do the big NBHA in NJ. It's a fair and QH show and NBHA race on August 4,5,6. In less than three months he has won now over $3,000 and a saddle doing QH, NBHA, IBRA (over $900 one IBRA show), an IPRA/APRA rodeo (over $1,000 two shows), and an NPBA futurity . The saddle is gorgeous black seat and black crosses nice end of day win. He won three breastplates and three halters, as well and a circuit award bag on one weekend." Look at this pedigree - Packin Sixes, Streakin Six, On The Money Red, and Bugs Alive, all on his papers. And he was out of an own daughter of Bugs Alive In 75! 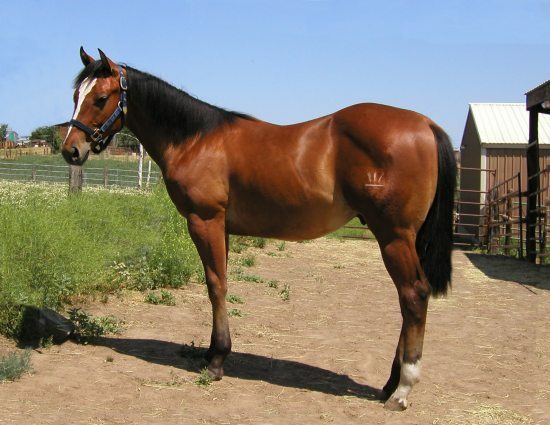 Tanner is enrolled in the Future Fortunes Incentive program and the AQHA Incentive fund.